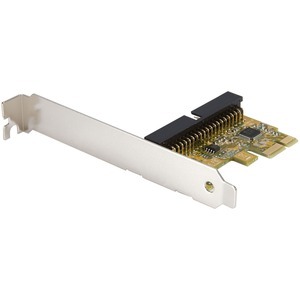 This PCI Express IDE Controller Adapter Card provides a cost-effective way to use legacy drives with modern computers, by converting a PCI Express port into an IDE port. Providing data burst transfer rates of up to 133MBps and support for PIO 0/1/2/3/4 and UDMA 33/66/100/133 operating modes, the IDE controller card offers an efficient way to add an IDE port. A complete dual profile solution, the PCI Express IDE controller card provides both standard and low profile brackets for adapting to slimline or small form factor system applications.